We had an amazing weekend at Clubs in San Francisco. The men were 16th and the women were 19th, and while those results may seem disappointing given our aspiration to put both teams in the top 10, I can assure you that I am extremely proud of our performance. Every single one of the 24 athletes who competed for GRC ran to the absolute best of his or her ability, and they all gave absolutely everything they had for their team, and that's all I can ever ask for. Clubs gets more and more competitive every year (consider that in 2006, the last time the meet was on this course, Luke ran 31:12 and was 19th, and this year Phil ran 31:04 and was 59th), and we competed toe to toe with the best runners in the country, and came away with our heads held high, secure in the knowledge that we represented GRC with distinction. I'm already looking forward to next year in Tallahassee, when we'll have another chance to compete as a team in a national championship race, and show what we can do on the big stage. In the men's A race, Phil ran superbly, and his placement of 59th was the third best finish for a man at Clubs in GRC history. Phil beat several national caliber runners in what was clearly his best performance in a GRC jersey, and we're going to see much more from him on the track this spring. Mike also ran an excellent race, placing 70th in 31:14. Mike is not a XC specialist, but he has run the 3 best XC races of his life at Clubs the last 3 years, and Saturday was the best of the bunch. Luke is an outstanding XC runner and was right with Phil and Mike for the first half of the race, but his injury induced lack of race sharpness caught up with him in the latter part of the race, and he finished 98th in 31:40. Luke did everything he could to come through for his team, and he left nothing in the tank, and I was very pleased with his effort, and his leadership. Cabell continued his breakout year with an excellent 32:06, a 10k PR, which is most impressive given that the course was challenging and muddy, not to mention slightly long. Matt Rand overcame an illness this week to run a very solid 32:11. Balmer had yet another strong performance at Clubs, finishing in 32:36, and he unleashed his trademark kick in the last 300, and picked up several important spots for the team. Sam had a tough day, finishing in 32:39, but he fought to the tape, and also picked off some guys in the final stretch, even though his tank was on empty. Tex Paul ran a very solid 32:48, which was by far his best race in at least the last year. The women were led by Frances L, whose stellar 70th place finish, in the excellent time of 21:35, was the third best finish ever by a GRC woman at Clubs. Frances has an extremely bright future, and she is going to be a force for GRC on the track and in XC for a long time to come. Maura was 87th in 21:55, which was unquestionably her best performance ever in a GRC jersey. Maura prefers longer distances on the roads, but she proved once again that she has the range and toughness to excel in XC. Hannah, who was 129th in 22:30, fought to the tape despite not being herself because of a health issue, and she did everything she could to help her team. Hannah will be ready to roll on the track, where she will be looking to crack the GRC top 5 list in several events. Kara ran an extremely gutty race, finishing in 22:54, and even though 6k is at the top end of her range, she ran hard from the gun and kept fighting to the end. 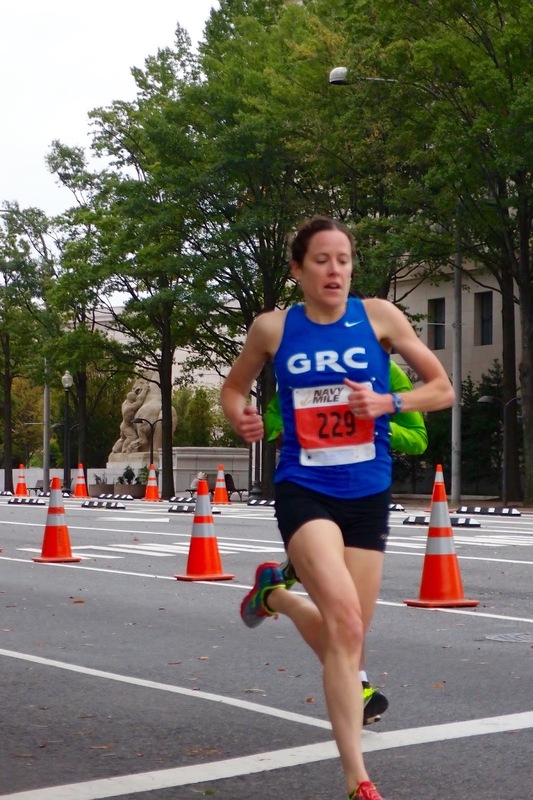 In what may have been the last major race in her outstanding GRC career, Susan ran a very solid 22:59. Susan was our first major woman's recruit, and her leadership has been instrumental in building our women's program into the juggernaut it has become. Chelsea gave an extraordinary effort to finish in 23:03 off of very limited training due to nagging injuries, and when she is able to combine the competitive fire she showed on Saturday with consistent training, she will be a major contributor on the track and in XC. Sara is still in the early stages of her return to racing after her severe injury, and her time of 23:56 was a very encouraging sign on the way back to full fitness. Keely took a big step up in the level of competition, and a big step down in distance, and acquitted herself well, running 24:33. I was particularly proud of the tenacity with which with the women competed because before the gun went off, they knew that they would not be able to meet their goal of a top 10 finish due to the late scratches of Katie and Tina, both of whom would have been major contributors, which left them short-handed in an extremely competitive field, yet each of the women who got on the starting line ran extremely hard for each other, and for their teammates who were not able to compete. The inaugural men's B race was an unqualified success as the guys delivered an excellent second place finish, beating several teams whose A squads beat us. More importantly, their strong performance prevented me from looking like a clown after I argued vociferously at the coach's meeting the night before that our B team belongs in the A race. Kyle led the way with an excellent 18th place finish in 33:07. Kyle's tactics were superb as he moved up steadily throughout the second half of the race. Sean went out hard and hung tough in the last mile to finish 26th in 33:32. Luk ran a very solid race, finishing 35th in 33:55, and showed that he has the strength to make a successful transition from the 800 to longer distances on the track. In his first XC race since his freshman year of high school, Chris ran an excellent 34:15, which is a PR. Chris also moved up steadily throughout the race, and looked like a guy who's done this a lot more recently than 15 years ago. Dickson ran a very solid 34:24 in his first hand effort since MCM. Tom had a tough day, finishing in 34:24, but he's had a great season, and is in great shape, and will be ready to make some noise on the track. Greg ran a strong 34:45, and he is also fit and ready for a big track season. In his masters debut, Wertz and I both learned a valuable (and in his case, painful) lesson about how competitive the masters race is on this level. We knew it was going to be tough, but not nearly that tough, and because we did not appreciate the quality and depth of the field, based on my ill-advised instructions, Dave was a little too aggressive early, and he paid the price for it late. Despite being out of gas by 4 miles, Dave hung on as best he could, and finished a very respectable 35th place in 34:09. Now that we've got a full understanding of what he's up against, Dave will be ready for redemption next year. There is practice at BCC on Wednesday at 7:15, so meet for the warmup at 6:30. If you're interested in coming out, let me know, and we'll get a plan for you. The GRC Mens' A-team finished 16th overall in what appears to have been a very competitive field at the USATF Club Cross Country Nationals in San Francisco. The women's A-team finished 19th overall. GRC showed some depth with a second place finish in the B Competition with many runners putting in A-race caliber performances. Dangerous Dave Wertz came in 35th in the masters' race with a time of 34:09. Its mid-December once more, and before our GRC squads change into road flats or track spikes, they'll gather once more on the grass, mud and (this year) sand to run a hard distance race with 200+ of their closest friends. That's right running fans, its time for USATF Club Cross County Nationals! In true cross country fashion, GRC's teams this year are led by milers, marathoners and everyone in between. They'll travel together across this great land to the great city of San Francisco, where they'll throw down in Golden Gate Park this Saturday. Though the long trip means we'll put fewer runners on the line than last year, we're bringing a much larger group than when we went to Bend two years ago. "Our goal for the men is to grad a top-10 spot. After a 9th place finish two years ago in Bend, the Men are hungry to get back to that level on their return trip to the West Coast. We've got a very experienced top 5, as Mike, Luke, and Sam have all run numerous Clubs for us and are all in great shape. Matt Rand scored for us last year, and he's in better shape this year. Phil and Cabell will be making their first appearances for GRC at Clubs. Phil is the USATF Eastern Region champion and could be our top man, and Cabell is ready for a big breakthrough. Balmer and Tex round out the A squad, both bringing solid Clubs experience with them." "The women's A team has had a lot of new faces this year, but we've reloaded with Hannah, and Frances Loeb and will be gunning for a strong team finish. Maura and Susan will be running their first Clubs since 2012, and with Hannah and Frances, they should be a solid front group. Kara, Tina, and Chelsea are also running on the A team and will give us solid depth in a race this size." "It will be uncharted territory for Wertz in the masters race. There's a whole lot of competition, but he's got a very good shot at being in the top 10. It's also going to be a whole new experience for everyone in the men's open B race, which is being held for the first time this year due to the massive Men's Open race in Lehigh. We've got a very solid group, led by Tom and Sean, both of whom ran well last year. We should see strong performances from Kyle, Luk, Greg, and Chris in their first clubs. Dickson is only a few weeks removed from MCM, but he's going to give it a go." As always, we'll have live updates coming from the course for as long as my phone battery stays alive. So follow us on twitter for up to the hour stats and projections. The highly coveted but rarely awarded GRC Athlete of the Week goes to Kerry for her outstanding performance at the California International Marathon, where she ran 2:51:55, a 5 minute PR, which ties her for 5th on the all time GRC list with Julie, who ran the exact same time at CIM last year. 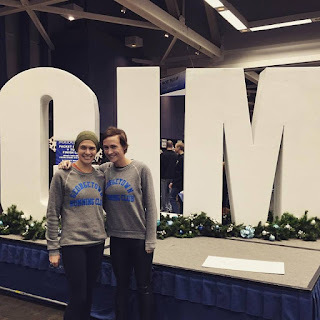 Kerry had a serious injury that kept her out of action for an extended period of time, and shortened her training cycle for CIM, and for her to run such a significant PR in her first serious race after the injury is truly impressive. Outstanding job! Also at CIM, Beth ran 3:04:33, which is a solid performance given that she has had an absolutely brutal year at work. With Beth's insane work schedule, it's borderline miraculous that she was able to finish a marathon, let alone to run competitively. Finally at CIM, GRC superstar to be Sarah Bishop ran a giant PR of 2:47:37. Imagine what Sarah will do after a few months of being exposed to the GRC magic! Closer to home, Kevin got the win at Jingle All the Way 5k in 15:31, followed by Ryan in second in 15:41, and Chris in fifth in a very nice PR of 15:52. On the women's side, Teal was third in 18:17, which was a big PR, so much so that Teal is thinking about bailing on this whole marathon thing and becoming a miler. Future GRC superstar and fellow Olympic Trials qualifier Emily Potter got the win in 17:37. Keep an eye on those two young ladies, who will be representing GRC in a race a little more significant than a holiday 5k in about 10 weeks. We're set for TUESDAY at BCC at 7:15, so meet for the warmup at 6:30. See you tomorrow at BCC. On the heels of a bout of plantar fasciitis, Kerry Allen notched a 2:51 today at California International Marathon, good for a five-minute PR. Her splits appear to have been where they needed to be, having gone through in 1:24:37. 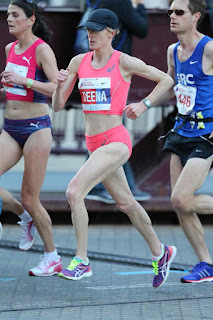 "Kerry ran a huge PR, which would be worthy of celebration under any circumstances, and it was a particularly special performance given that she came back from a serious injury that had her on the shelf for months, and limited her preparation for CIM," said Coach Jerry Alexander. "With good health over the next couple of years, Kerry will be a real threat to make the Trials in 2020." Beth Young was not in a position to get a PR today (which would have been south of 2:50) but she was able to secure a solid BQ and a fine excuse to spend some time in wine country. This writer acknowledges the support that CIM has lent to the club over the past three years. The race organizers have been extremely hospitable and our runners have enjoyed a great deal of success at the event, which, by my count, has yielded five big PRs in only two races: Teal's OTC; Outlaw's successful debut at the distance; and Julie's, Kerry's, and Breezy's multi-minute PRs. Tomorrow morning Kerry "the Banana" Allen and Beth Young will be hitting the streets of Sacramento to take on the California International Marathon. Numerous GRC runners have claimed PRs at this race and with any luck these two will do the same. The forecast calls for the right temps, but with a high chance of rain. Best of luck to both runners. Stay tuned for results. Send em! The GRC participates in Thanksgiving fitness activities! 'Twas daybreak on Thanksgiving, and the pies had been prepped, the turkeys had been thawed, the wine had been stockpiled, and a hush had fallen upon kitchens across America. Chefs would soon take to their roasting pans and basters, TVs would soon be tuned to the day's football entertainment, and dinner rolls would soon undoubtedly be forgotten in the oven, but the early morning hours belong to the turkey trotters, whose pre-race peanut butter-banana toast is at odds with the typical gluttony of the day. Fortunately, the GRC likes to break the mold, and its members were scheming to dominate races from coast to coast before the food comas set in. The GRC was out in full force at the Alexandria Turkey Trot 5 miler. Tom Kelly made the impossible possible with a PR, and ex-pat Matias was first in the stroller category with TWO passengers along for the ride. No man (or child) left behind on Thanksgiving! Congratulations as well to Matias' wife Katie, who finished in 36:26, and Chris' mom, who placed first in her age group! The GRC was also represented well in Nazareth, PA at the Pumpkin Pie 5k. Sam Luff repeated as winner of the race and also of a pie, and Dickson Mercer finished in third but also won a pie! Exact pie details were not given, but pumpkin seems like a likely candidate. We're also unsure as to whether the pies were eaten at the Thanksgiving table or whether they might have been better suited to a post-race recovery snack. 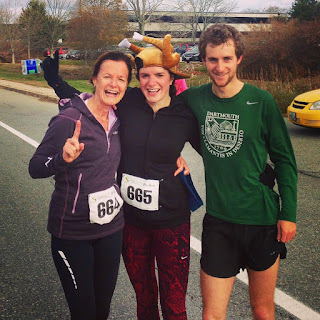 Julie Tarallo, meanwhile, not only secured the coveted bib number 1 at the Tiger Turkey Chase 5 Miler in Easton, MA, but managed to snag an approximately Julie-sized frozen turkey with a winning time of 30:27. Julie shows off her turkey hoisting ability below. Note: this was not consumed as a post-race snack. 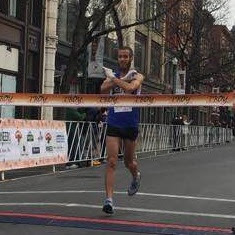 Kieran O'Connor got the win in 31:30 at the Troy Turkey Trot 10k in upstate NY. Pay special attention to his new signature "OC" victory pose. The jury is still out on whether it will catch on. Mike Franklin repeated as the winner of the Morris Township Thanksgiving Day 5k Turkey Trot in Morristown, NJ, with a time of 15:58.5, while middle distance star Cecilia Barowski, whose weekly mileage used to be mainly made up of the Wednesday workouts' warm up, ran an excellent 18:36.0 for 5th place in a competitive field. Katie Kieran won the Y Turkey Trot Charity 5k in Towson, MD in 17:42. Up north, native Minnesoootan Kyle Wagener battled snow and mid-thirties temps to finish 5th in a competitive field in the Minneapolis Turkey Day 5k with a time of 15:55. He was rewarded with a pumpkin pie for a top ten finish and braving what is probably a typical fall day in Minneapolis. Closer to the familiar oval of BCC, three of GRC's favorite men ran the Bethesda Turkey Chase 10k. Luke Meyer got the win in 31:26, Paul Balmer was 5th in 32:14, and Sean O'Leary finished 7th in 33:33. Cabell Willis and Teal Burrell secured matching second place finishes in the Richmond Turkey Trot 10k, running 32:21 and 38:14, respectively, despite their generally very different race length preferences. Teal's husband Rusty also competed well, running 46:38. He didn't quite make the cut for the post-race photo, however. Ryan Witters also finished in second place at the Goodwill Turkey Day 5k in Evansville, IN, running 15:00 in a competitive field. Phil Royer took the roads of Newport, RI and social media by storm with a win in 24:43 at the hilly, competitive 30th Annual Pie Run and with the below family photo, which garnered the most Facebook likes he's ever received. Well done on both fronts, Phil! 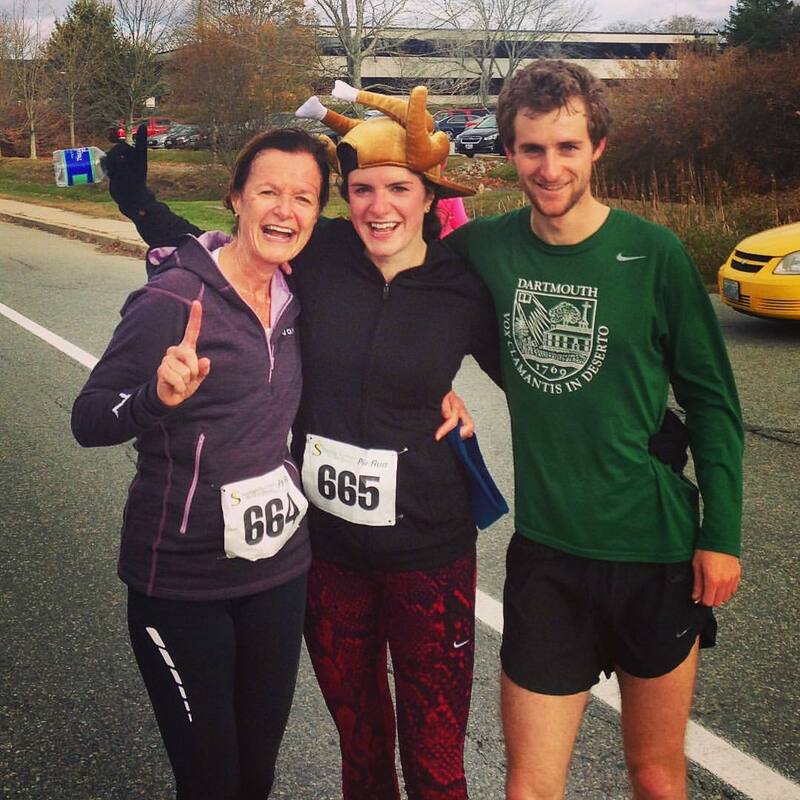 Speaking of photogenic families, Laura, Dave, and Greta O'Hara ran, ran, and stroller-rode (respectively) the Fairfax Turkey Trot 5k. LTO ran an impressive 19:33 for the win, finishing with an incredible kick, and Dave O and Greta crossed the line in 21:41. The Reiches also showed some family unity in finishing only seconds apart at the Way Station's Turkey Trot 5k in Frederick after spending a few days in Costa Rica. In her first race as a Reich, Stephanie got her new name off to a good start with a win in 17:49 and Stewart appears to have outkicked her with a finishing time of 17:45. You'll get him next time, Steph! In the creatively named town of Forty-Fort, PA, the Olenginski brothers went 1-2 in Tim's Turkey Trot. Luk ran 25:18 for 5 miles and Greg followed in 25:58. Greg and Luk (or is it Luk and Greg?) will look to take over the podium again in a few weeks at clubs clubs clubs! In the wilds of Laurel, MD, Susan Hendrick welcomed herself home from a week in the tropics with a first place showing at Tom's Reindeer Run 5k in 19:18, which was also good for third place overall. Santa was apparently on hand for this race as well. We've entered the Christmas season, folks! It was another big weekend for GRC in Philadelphia, as we had several athletes in action at various distances. Frances K got the weekend started with a bang, placing 3rd in the Rothman 8k in the excellent time of 26:26, which is yet another new club record. That Frances was able to run so well after only a handful of workouts since her return from injury is a great sign of things to come for her in 2016. 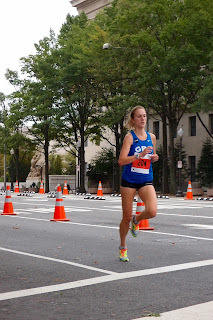 In the half on Sunday, Teal made a promising return to competition, running 1:21:49 as a hard tempo. Teal has also just begun workouts after a serious injury, and she is well on her way to being ready to make some noise at the Trials. Also in the half, Keely ran a nice PR of 1:25:45, and former (and possibly future) GRC superstar Catherine Campbell ran a PR of 1:22:30. I was quite pleased with Keely's performance, and I'm looking forward to her continued development in the future. In the full marathon, Charlie ran 2:39:52, and Fridge ran 2:41:31. They both struggled with extremely windy conditions, and while neither of them was particularly pleased with the result, they were both in excellent shape, and will run much faster the next time out. In non-Philly results, Balmer tempoed a controlled 1:14:43 for second place at the Annapolis half on a hilly course. There is no practice on Wednesday, but I will be at BCC on Tuesday night for those of you who are looking to get in a workout this week. We're getting an early start, so meet for the warmup at 5:45, and we'll roll at about 6:15. If you want to come out and need to start later, that works too, so let me know. The practice schedule leading up to Clubs is that we will be at BCC on Wednesday 12-2 for our final hard workout, and that's one you won't want to miss. We'll get on the grass for a moderate workout on Saturday 12-5, and we'll do a final light workout on Tuesday 12-8 at BCC. Good luck with the turkey trotting, and enjoy your holiday. Fridge and Charlie hate running now. We had some excellent performances at the USATF East Region XC Championship in Philadelphia on Sunday. The men scored 26 points to easily top the field, and Phil got the win in 26:26 on the very challenging Belmont Plateau course. Matt Rand ran a very solid 26:48, followed closely by Cabell in 27:00, Mike in 27:04, and Balmer in 27:06. The 40 second spread for our top 5 bodes very well for Clubs, and when we add in a couple of our top guys who were not in Philly, we will have an excellent shot to get back into the top 10. The women, who placed second, were led by Katie in a very strong 18:42, followed by Hannah in 19:12, Maura in 19:14, Frances L in 19:15, Susan in 20:14, and Chelsea in 20:44. The women are determined to improve on last year's 10th place finish, and I am confident that they will be ready to do so when the gun goes off in San Francisco. The road highlight of the weekend was Kevin's triumphant return to action at the St Rita's 5k, where he ran a very comfortable 15:35. Kevin has been out of action since May due to injury, and while he has a ways to go to get back to his dominant form of last spring, he is well on his way to full fitness. 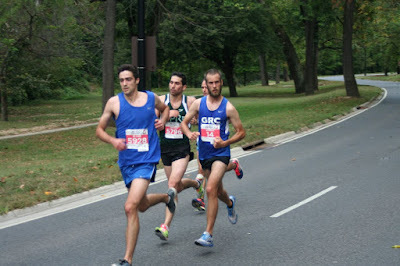 Also at St Rita's, Wertz made his masters debut, running 15:53, followed by Chris in 16:02 and Dickson in 16:05. On the women's side, Kara got the win in 18:52. LTO ran 21:32, but despite her best efforts, she was the second woman in her own household, as she was edged out by a stroller length by young Greta. GRC did not compete in the USATF 12k champs, but we were there in spirit. Alexi Pappas, a teammate of Nina's at Dartmouth, wore a Nina patch and finished 9th in the elite field. Nina would have been proud to be a part of such a great performance. We're at BCC for our normal 7:15 start on Wednesday, so meet for the warmup at 6:30. It was another big weekend for GRC, with numerous excellent performances. The Veterans Day 10k was a triumphant return to competition for Frances Koons, whose track season was cut short by a serious injury. With only a few weeks of running under her belt, and not much in the way of quality work, Frances ran the outstanding time of 34:12, which is a new GRC Club record. I'm going to go out on a limb here and say Frances just might have a knack for this whole running thing. Not to be lost in the hoopla over Frances's return is the excellent GRC debut of Stephanie Bryan, who placed second in 35:04, which was a huge PR, and puts her 4th on the GRC all-time list. Steph is going to be a major contributor to our track group, and I'm really looking forward to seeing what she can in 2016. Also at Vets Day, Hannah was fifth in 37:06, Frances L was sixth in 37:16, and Maura was seventh in 37:22. Nice work, ladies! The men were in action at Vets Day as well, and Mike lead from the gun and got the win in a very strong 31:08. Mike is rounding into shape at the right time, so keep an eye on that young fella. Phil was third in a solid 31:32, followed by Balmer in fifth in 32:07, Sam in seventh in 32:15, Tom in ninth in 32:41, Zak in tenth in 32:42, and Wertz in eleventh in 32:43. I was extremely pleased with Zak's performance, which was not only a huge PR, but most likely the best race of his life. In non-Vets Day results, Matt Rand ran 31:15 for the win at the Rockville Centre 10k in New York, which is a 29 second road PR. To say Matt ran alone from the gun is an understatement--second place was over 3:30 behind him--making his run that much more impressive. Jerry Outlaw followed up his big PR in Philly last week with a controlled 1:11:53 at the Battlefield Half in Winchester, where he placed fifth in a competitive field. We also had a wonderful example of community outreach this weekend, when Big City guided visually impaired athlete Matthew Rodjom to the win at the Race to End Women's Cancer 5k in 17:30. GRC has made a commitment to guide elite visually impaired athletes, and it's a service I'm very proud to see us continue to provide. Thanks to Chuck for upholding this wonderful tradition. We'll be at BCC for our normal 7:15 start, so meet for the warmup at 6:30. Fall sports are concluded, so we will have smooth sailing on Wednesday nights at BCC for the rest of the year. I'm still trying to get my head around Kieran's amazing performance at the Philly RNR half marathon on Saturday, where he ran the truly outstanding time of 1:04:39, and qualified for the Olympic Trials Marathon with room to spare. To say Kieran had the race of his life would be an understatement, and I could not be more proud of his spectacular run. The research arm of GRC has swung into action to answer the compelling questions the media throng have been asking me since the moment he crossed the line. GRC historians are hard at work trying to determine if Kieran's race was the greatest performance ever by a GRC man. GRC statisticians are trying to calculate the odds that a guy who stated in his introductory email to GRC in May 2013 that he did "the bare minimum to get by" when he ran high school cross country, who did not run competitively until after he graduated college in 2009, and did not train in an organized setting until he joined GRC in the summer of 2013, could meet the very, very difficult Trials qualification standard out of the half marathon barely 2 years later. And GRC's aeronautical engineers are utilizing the latest wind tunnel technology to calculate how much faster Kieran would have run if he had shaved his beard. Whatever the answers to those questions prove to be, we can all take great pride in Kieran's magnificent accomplishment. Well done! There were other notable performances in Philly. Blake Taneff made an excellent GRC debut by running 1:06:54, a PR of over 2 minutes, which puts him 4th on the GRC all-time list. Blake, a standout at Ohio State who has ran 29:12 for 10,000 on the track, hopes to join Kieran in LA for the Trials, and I like his chances to hit the standard when he takes his next shot in January. Jerry Outlaw ran a very nice PR of 1:09:35, which sets him up well for another marathon PR in Houston in January. Tex Paul ran a solid 1:10:32, which is a big step forward as he continues to return to full fitness. Last but not least, Chris ran a huge PR of 1:12:20, which I was particularly pleased with. When Chris joined GRC in May, I regarded him as a developmental runner who was going to need at least a year to progress to the level of accomplishment that we expect from our members, but Chris accelerated that timetable considerably with his major breakthrough on Saturday. 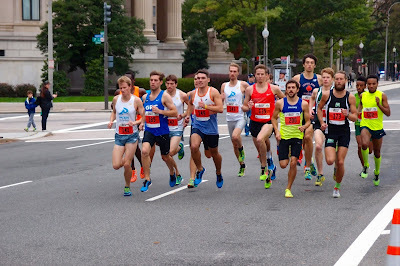 In non-Philly results, our men's class of 2015 ran the Parks 10k, and since each of them made their debut at the distance, it was PRs all around. Kyle W led the way, finishing 3rd in 33:06, followed by Lukasz in 4th in 33:09, and Greg in 6th in 34:02. Future GRC superstar Emily Potter was second in 36:39, and they combined to win the team title. Katie continued her winning ways at the Baltimore Trick or Trot "5k" where she ran 17:46 on a course that was at least 100 meters long. Finally, Teal made her return to racing in a low key "5k" in New Jersey, and her time over the indeterminate distance was 18:48. However far she actually ran, the important point is that Teal is healthy again and back in training, as she's got a race in February that is of slightly more consequence to get ready for! We'll be at BCC on Wednesday for our normal 7:15 start, so meet for the warmup at 6:30. FLASH: O'CONOR PUNCHES OLYMPIC TRIALS TICKET - UPDATE! 1:04:38!! 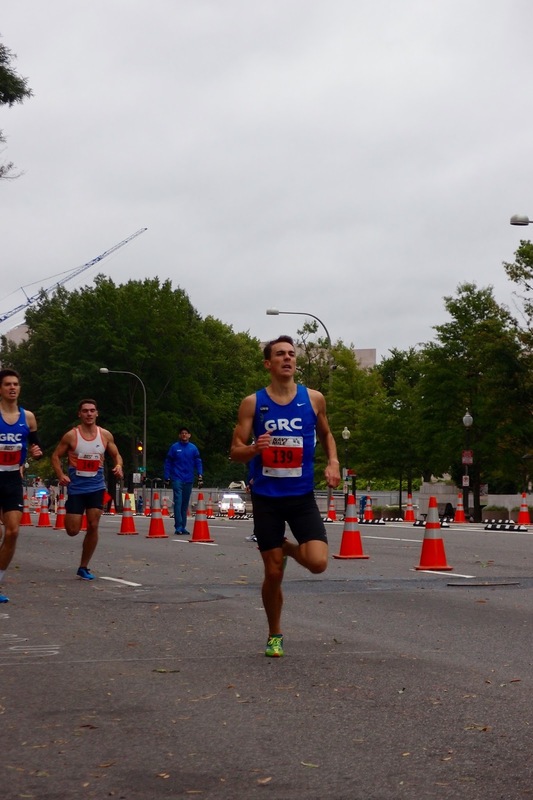 Philadelphia, PA - Kieran O'Conor joined Teal Burrell this morning as the second GRC runner to qualify for the 2016 United States Olympic Team Trials in the marathon. At the race formerly known as the Philly Distance Run, Kieran's *unofficial* OFFICIAL half-marathon time of 1:04:38 betters the qualifying standard by 22 seconds. In the process, Kieran also shattered the GRC record in the half. Many congratulations to Kieran. It is now the duty of all GRC athletes to convince Kieran to join the team for the USATF Club National Cross Country meet in San Francisco in December. Kieran ran 1:04:38 this morning at the Philly RNR half, which qualifies him for the Olympic Trials Marathon! Congratulations to him for an amazing race, which is a new club record, and arguably the greatest performance in the history of the GRC men's program. And while his performance was outstanding on an objective level (he ran 4:56 pace for a half! ), it was an even more amazing if we consider it in context. When Kieran joined GRC in the summer of 2013, he had never run 4:56 pace for a 5k, and his 5 mile PR was north of 26 minutes. Even after a major breakthrough in 2014, his half PR coming in to today was 1:05:58, so he improved by 80 seconds in one race, which is almost unheard of at that level. Kieran's development in a little more than 2 years has been truly spectacular, and it was based on hard work and a stubborn refusal to accept limitations. Kieran is just starting to tap into his potential, and he has great things in his future. A hearty GRC mazel tov to Kieran for a job well done! The big race of the weekend was the Marine Corps Marathon, and Dickson represented GRC with distinction, finishing 17th in 2:34:45. Dix had a great training cycle, and felt confident he could run close to 2:30, but the marathon is a unique and cruel event, and some days things don't quite go the way you expect them to. Dix gave it absolutely everything he had out there, and he was extremely pleased with the effort. I'm very proud of Dickson's execution of the race plan, and of his approach to the race in the weeks and months leading up to it. He did everything right in training, and ran with patience and toughness, and that's all I can ever ask of anyone. Well done! We had several athletes in action at 5ks across the area. Kara won the Run/Walk to End HIV 5k in a very impressive 17:45. Maura and Susan ran the Goblin Gallop "5k" in Virginia, which turned out to be a little more than they bargained for when the course marshal mismarked a turn, resulting in the addition of approximately 250 meters. While the inaccurate course renders their times meaningless, they were second and third overall, and got to enjoy an awesome Halloween parade for their trouble. We're good to go at BCC on Wednesday. Next week there may be a conflict, depending on the soccer playoffs. We may not get much advance notice on the potential conflict, so be sure to pay attention to the workout email next week. The backup location is the mall. After next week, it should be smooth sailing at BCC. We're set for our normal 7:15 start at BCC, so meet for the warmup at 6:30. Led by Cabell's 2nd place finish, the GRC Men's team took the overall victory at the Gettsyburg Invitational. Cabell was joined in the Top 10 by Paul B and Kyle W.
BReuters Wire Services -- Manassas, Va.
Sam Luff was first across the finish line at the Glory Days XC Invitational in Manassas this morning with a time of 16:22. Luke Meyer, followed by Cabell and Kyle W, were in the lead with 20 meters to go until Meyer, an Ivy League Alumnus, took a wrong turn, which added about 200 meters to their run. Although the matter has been referred to the GRC Inspector General, who will determine whether Meyer was attempting to gain an unfair advantage over other racerunners (#wrongwaygate! ), bystanders report that the mistake was eminently understandable and that the three runners competed hard today. Dangerous Dave Wertz came in eighth and this author salvaged a spot in the high teens. Best of luck to Dave O'Hara, whose HS team was also racing today at the invitational. Fast forward Friday. This photograph is from the future. For now, we can revel in the fact that October plays host to prettier Instagram shots involving leaves and flannel. Oh, and I suppose that there's usually a long list of exciting races for our harriers to send 'em at. This weekend in particular sees the GRC tackle a wide variety of distances and surfaces. On Saturday, a rag-tag group of guys will take to the hill and dale of Bull Run Regional Park in Centreville, VA for the Glory Days XC 5k. With just a hair over two months until Club Nationals, we've got Luke, Sam, Cabell, Kyle W, Wertz, and Breezy breaking in their spikes well in advance. The word on the street is that anyone who runs slower than the winning time of the high school race will not be allowed to ride back to DC with the rest of the group. Sunday will see two strong groups take a 50-60 minute tour of the DC Monuments at the Army 10 Miler. On the women's side, youth and experience unite in the form of Hannah, Frances L, Maura, Keely, and Kerry. Hannah and Frances will be making their 10 mile debuts, and Coach Jerry is optimistic that they'll surprise themselves at this new distance. Coming off of a consistent summer of The Hard Training, Maura also looks more than ready for a breakthrough. The men might see a larger team spread, but also send a strong field including Mike, Phil, Outlaw, Sean, Balmer, Tom, Charlie, and Kyle C. While the back half of that pack has some experience with the longer distances, Mike and Phil are making their 10-mile debuts. Tom gets Coach Jerry's "Athlete to Watch" distinction, and Mike gets the slightly-less-positive "Athlete to Keep an Eye On." Coach Jerry explains, "assuming Mike is successful in picking up his packet this time around, this will be his 10 mile debut. It's early in the season for him, but he should be ready for a solid performance." Mike hasn't e-mailed me in response to my offer to pick up his packet, so our fingers are crossed at this point. Never one to be forgotten, ageless Pat Kuhlmann will also take a shot at a strong Sunday performance in the Chicago Marathon. According to Coach Jerry, "Pat has had a great training cycle, and if the conditions are conducive, he's got a real shot at a PR." The forecast looks a tad warm right now, but having seen Pat crank out fast mile repeats in peak DC humidity, he's conditioned well for the challenge. Keep your dials tuned to this station all weekend for reports of greatness! It was another big weekend of racing, with strong performances at Paul Short and the Navy Mile. Our intrepid cross country crew was led by Frances Loeb, who was 7th in 21:54. On the men's side, Phil was 11th in 25:18, followed by our new twin superstars Luk and Greg in 26:31 and 26:58. The times were slow due to sloppy conditions, but I was quite pleased with all of these performances. 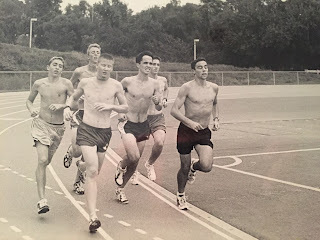 The times were also slow at the Navy Mile due to a strong headwind for the out section of the out and back course, and sit and kick tactics from the pro milers that assembled for the huge prize purse, but our gang competed very well. Katie was 7th in 5:17 and Susan was 9th in 5:27. For the men, Stewart was 8th in 4:23, Cabell was 10th in 4:27, and Ryan was 14th in 4:31. I was particularly happy with Stewart's performance, as he was not intimidated by the very strong field, and he executed his race plan with the patience that has at times eluded him in the past. As Stewart learns to race at the highest levels, we are going to see great things from him in the future. Several of our athletes planned to run the Wilson Bridge Half, but the weatherman had other ideas, and the race was cancelled. Zak made the best of it by winning the Boo Run for Life 10k in a very nice PR of 33:28. Considering that Zak was gearing up to run a half, and he won by 30 seconds, that is an excellent performance. In addition to those who planned to compete, Phil, Mike, and Tex Paul were going to serve as guides for elite visually impaired runners, which is a service I'm proud to say that GRC provides at Wilson Bridge every year. It's a shame that the guys missed out on the chance to serve, as it's always a great experience, and one I hope many of you will have the opportunity to enjoy in the future. We're at BCC TONIGHT for our normal 7:15 start, so meet for the warmup at 6:30. Next week, we're on the mall on Wednesday, and with any luck, after that we'll be back to Wednesday nights at BCC. See you TONIGHT at BCC. Joaquin-lite conditions contributed to a tough morning for fast running, but GRC athletes made the best of the Navy Mile. While crowds may have been sparse on an unusually chilly October morning, a generous prize purse ensured that both the men and women dealt with a healthy level of competition. Scuttlebutt heard around the event suggests that racing a mile in October feels weird. Don't worry folks, track season is only a few months away! A number of GRC harriers braved true cross-country conditions up in Lehigh, PA this morning. Joaquin who? The highly coveted and rarely awarded GRC Athlete of the Week goes to Kieran for his outstanding performance at Clarendon Day. In the 5k, Kieran ran 14:35, which is a new club record and a gigantic PR, and he came back a few minutes later to win the 10k in 31:42. Kieran is in the midst of training for the Philly RNR half, and that he was able to break the club record at a distance that is well outside of his wheelhouse without having done any speedwork is proof positive that he has an excellent shot at qualifying for the Olympic Trials in Philly. Well done, young fella! There were many other fine performances at Clarendon Day. Katie won the women's race in 17:21, which was her fastest 5k since the Clinton administration, and puts her third on the GRC all-time list. Susan ran a very solid 18:08 in her season debut. For the men, former club record holder Witty made a promising season debut in 14:48, and considering that Ryan has only been running workouts for a few weeks, he will have an excellent chance of reclaiming the club record later this fall. Also of note in the 5k, Tom ran a big PR of 15:29. In the 10k, Mike made his season debut in 32:17, and we'll certainly see much faster times from him as the season progresses, and Kerry continued her comeback from injury with a solid 39:40. Clarendon marked the GRC debut of three members of the GRC class of 2015, Kyle Wagener, Lukasz Olenginski, and Greg Olenginski. Kyle, who ran 15:39, is a recent graduate of St. Olaf, and he will be looking to make his mark in the 5000 and 10,000 on the track. Luk and Greg, who both recently graduated from Franklin and Marshall, were standouts at 800 and 1500 meters in college, and they will be looking to improve at 1500 while transitioning to the 3000 and 5000. Welcome aboard! Last but not least, Maura ran a PR of 36:13 at the Great Race in Pittsburgh. Maura is in excellent shape, and we're going to see more PRs from her in the weeks and months ahead. We're ON THE MALL on Wednesday. Meet for the warmup at 6:30, and we'll get started as promptly at 7:15. I'll be out there by 6:30 to watch your stuff. As always, we will use the interior loop between 4th and 7th Streets, and we will muster on the 7th street side, on the north corner of the loop. If you're driving, there is ample parking on the roads around the mall. If you're taking metro, the Smithsonian stop is a few blocks to the west (exit on the mall and walk towards the Capital, cross 7th street, and the meeting spot is on the north side of the loop). If you're taking the red line, go to Gallery Place, exit at 7th street, and proceed south towards the mall. I'll send the women's workout separately. I'll see you on the mall on Wednesday. We had several fine performances this weekend at various distances, but the top story occurred off the track when Jake announced that he is retiring from racing. When the history of GRC is written, Jake will be featured prominently, both for his achievements as an athlete, which were impressive, and for his multitude of contributions to the team behind the scenes. It's not an exaggeration to say that Jake's vision and persistence formed the foundation of GRC, and we all owe him a huge debt of gratitude for his years of hard work and dedication. I urge all of you to read Jake's blog post, and to find inspiration in his story. I'm certain that I speak for the entire team when I say that he will be missed. As for the racing, we had a strong crew at the Parks half marathon, led by Kieran's 2d place finish in 1:11:40, Sam in 6th 1:13:17, Sean O in 7th 1:13:21, and Jake in 9th 1:15:43. Parks is a challenging course, and our guys ran it as a workout, so these results bode very well for fast times when the real racing starts. Phil got an excellent start to his fall season by finishing 4th at the Dartmouth XC Invitational, where he ran 24:31 for "8k." Phil is sure the course was a tad short, and he thinks his time is worth about 25 flat for the full distance, but that is still a very promising performance on a hilly course. 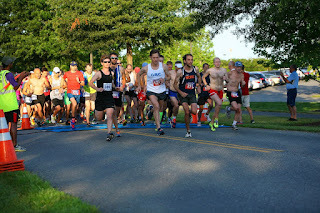 Stewart is already in mid-season form, as he proved by winning the Frederick Market Street Mile in 4:15. 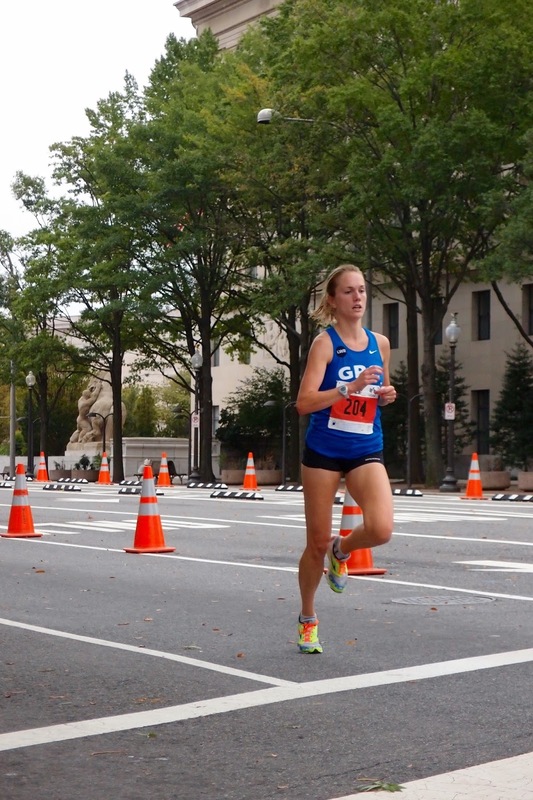 Finally, Katie was second in the Shoebox Shuffle 5k in Baltimore in a very strong 17:52 on a hilly course. We're set for our normal 7:15 start at BCC on Wednesday, so meet for the warmup at 6:30. Stewart Reich and his soon-to-be-wife Stephanie Bryan got some nice press after each winning the Market Street Mile in Frederick in 4:15 and 4:59. Stewart told the Frederick News-Post: "My whole fall is planned out, then, my season stops. My spring is an open schedule. Hopefully, we'll be running happily every after. The men got into action this weekend with victories at Kentlands 5k, National Press Club 5k, and the Larry Noel 15k. At Kentlands, Mike, Kieran, and Stewart went 1-2-3 in 15:17, 15:18, and 15:19, with Sam 5th in 15:47, and Sean 6th in 16:04. This was Mike's first race of 2015, and he looks none the worse for wear after injury limited him in the spring. Indeed, Mike appears to be in better shape at this point in the season than in his previous two years with GRC, so we're going to see him make up for lost time this fall. Kieran is gearing up for his shot at qualifying for the Trials in the half, and his very comfortable effort on Saturday is more proof that he's on schedule for a major breakthrough in October. Stewart is already in mid-season form, and he's going to be ready for some big PRs in the coming weeks. Sam is also working his way back into shape after some nagging injuries hampered him in the spring, and this controlled effort was another step in the right direction. Sean is taking a patient approach in his training, and he will be ready to roll when the real racing starts. At the Press Club 5k, Pat K led from the gun, winning by over a minute in 16:33. Pat is getting ready for a big PR in Chicago, and while he was hoping for some competition on Saturday to push him, his training is right where he wants it to be. Dickson was equally dominant at the Larry Noel 15k, which he won by 4 minutes in a very controlled 54:33 on a hilly course. Dix is also in full marathon prep mode as he gets ready for a big effort at MCM. On Wednesday we will be ON THE MALL for a 7:15 start, so meet for the warmup at 6:30. The long-promised specifics are that we use the interior loop between 4th and 7th Streets, which is very, very close to 800 meters (it may not be exact, but as we like to say in that part of town, it's close enough for government work). The drill is that we muster on the 7th street side, on the north corner of the loop. If you're driving, there is ample parking on the roads around the mall. If you're taking metro, the Smithsonian stop is a few blocks to the west (exit on the mall and walk towards the Capital, cross 7th street, and the meeting spot is on the north side of the loop). If you're taking the red line, go to Gallery Place, exit at 7th street, and proceed south towards the mall. It's less than a 10 minute walk. I will be there at 6:30 to watch your stuff during the warmup. See you on the mall on Wednesday. Two months out from his goal race at Marine Corps Marathon, Dickson Mercer rolls down the roads of Greenbelt en route to a first place finish at the Larry Noel 15k. Pat Kuhlmann coasted to victory this morning in the Press Club 5k in 16:33. Emily Dufton, mother of GRC mascot Bruno, continues to discover the benefits of doing the hard training and finishes 4th in 21:42. In Richmond, Charlie takes 8th overall and is top alum -- would've been No. 2 man for his alma mater -- in the Richmond Spider Alumni Open. And in later breaking news, Franklin, Kieran and Stu went 1-2-3 in the Kentlands 5k in 15:17, 18, and 19. Sam was 5th in 15:47 and Blur was 6th in 16:04. This story is no longer developing. It is finished. We had two strong performances at the Annapolis 10 Miler, with Tom finishing 4th in 55:59, and Chris finishing 5th in 56:41, a 65 second PR. Tom's time is significantly faster than he ran last year, and considering that Tom had an outstanding fall in 2014, we can expect big things from him in the weeks to come. That Chris was able to run a big PR on a hilly course in less than ideal weather is a sure sign of great results ahead. We'll get rolling Tuesday and Wednesday at 7:15 as normal, so meet for the warmup at 6:30. We had 3 strong performances in the mile at the MCRRC Going Green track meet on Friday night. New superstar Katie ran the second fastest track mile in GRC history, going 5:03.9. That was Katie's fastest mile since the Clinton administration, and now that she's reinvigorated her track career, she's going to make her mark on the all-time list at numerous distances. On the men's side, Stewart took the win in 4:25.9, followed by Tom in 4:27.6. Stewart led from the gun and looked controlled the whole way, which bodes extremely well for his fall season. Tom is steadily working his way back to fitness, and he will be ready to roll after Labor Day. We'll be back at the cell tower field on Saturday morning. We had a very nice turnout this past week, and a good time was had by all, so don't be shy about joining the fun. We're set for Wednesday night at BCC. The forecast looks favorable, and we can go back to our normal 7:15 start time, so meet for the warmup at 6:30. It was a light weekend of racing, but we had 2 very solid performances. Charlie got the win at Riley's Rumble half marathon in 1:13:46. While that may sound like a pedestrian time, on a challenging course in hot conditions it's quite impressive, and bodes well for some big PRs for Charlie this fall. In a slightly more competitive race in Maine, Matt Rand was 21st at the Beach to Beacon 10k, running 31:55. Matt finished directly ahead of the first woman, who was the bronze medalist in the 10,000 at the 2009 World Championships, and he's not saying whether he had to unleash his withering kick to edge her out. It's ladies night tomorrow. I'll send the women's workout separately. Guys, we're set for Wednesday at BCC. Let's start at 7:30 again, to allow the sun to drop a bit further before we roll, so meet for the warmup at 6:45. Ladies, I'll see you tomorrow. Guys, I'll see you Wednesday. 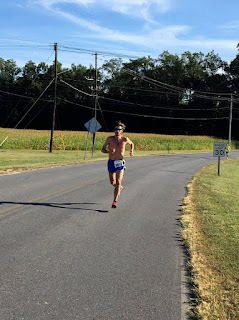 One week after a quality 5k at Crystal City, Charlie Ban Rumbled down the roads of Poolsville, Md to take top honors in the Riley's Rumble Half Marathon. He finished in 1:13:47 on what all agree is challenging and scenic course. We had some very nice performances at Crystal City Twilight. Our women's team, led by our Virginia-based mom's club of Shauneen, Katie, and GRC superstar to be Sarah Bishop, prevailed over a field of teams so competitive that it reminded knowledgeable road-side observers of the rigors of a Diamond League meet. Shauneen ran 17:55 for second, Katie ran 18:03 for third, and Sarah ran 18:14 for fifth. The performance of the night on the women's side came from Mary Grace who made her triumphant return to the scene of the crime, and with her knee intact, cruised to a 22:22, which is the first step on her journey back to full fitness. The men's team placed second to our longtime nemesis and gracious host, led by Phil in a comfortable 15:27, followed by Charlie in a very solid 15:38, Stewart in 15:41, Pat K. in 16:11, Tom in 16:23, Chris in 16:34, and Zak in 16:48. I was particularly pleased with Tom's performance, which is another step on his return to fitness after injury ended his track season before it began, and Chris's solid GRC debut. Chris is going to be a solid contributor to our road group, and I'm looking forward to seeing steady improvement from him over the coming months. We'll be at BCC on Wednesday night. It's going to be a hot one, and I would suggest that we push the start time back to 7:30, so that we allow the sun to dip behind the tree line before we get rolling. It would also help alleviate some of the crowding on the track. If there's a groundswell of opposition to the later start time, let me know. Otherwise, we'll plan for a 7:30 gun, so meet for the warmup at 6:45. The GRC women’s team won the team competition at the Crystal City Twilighter 5k last night. Shauneen took a close second in 17:55 with Katie finishing third in 18:03. The men’s team claimed second place in the team competition with Phil (4th in 15:27), Charlie (7th in 15:38), and Stewart (8th in 15:41) scoring. 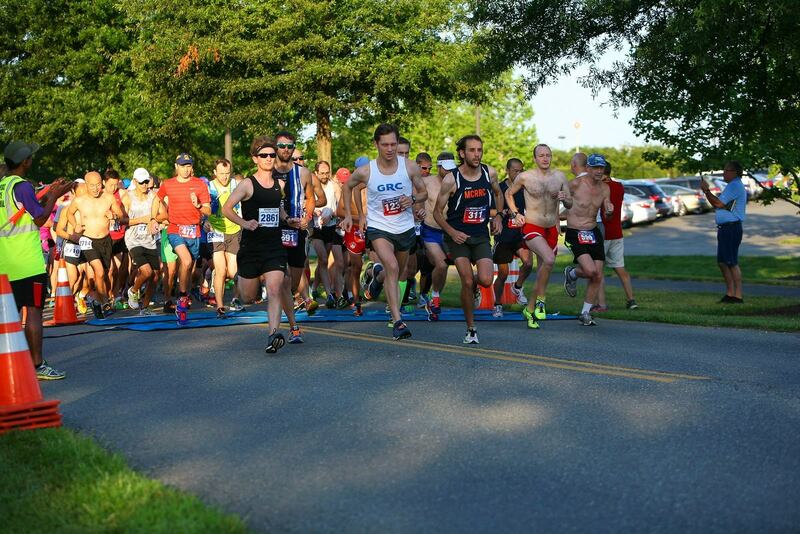 This Saturday night the place to be is on the streets of Crystal City, where a solid contingent of GRCers will race the Crystal City Twilighter 5K. The Pacers race, which boasts a fun team competition, has become one of the highlights of summer racing. Katie, Shauneen, and Mary Grace are running for the women. Katie is fresh off her very strong GRC debut (last week’s 5:13 mile at the DCRRC mile championship) and ready to run a fast road 5K. Shauneen is also in good shape, and Coach Jerry says Katie and Shauneen will be a strong 1-2 punch. Mary Grace is ready to punch goodbye to injury and is excited to get back to running after recovering from a torn ACL. The men’s crew includes Phil, Stewart, Tom, Dave O, Breezy, Charlie, Pat K, Zak, and Chris Van Es. Of special note is Chris, who is making his GRC debut. While training for the 2010 New York City Marathon and raising money for the Memorial Sloan-Kettering Cancer Center, Chris was diagnosed with cancer himself. He ran the race despite the treatment and, following his recovery, has set a steady progression of PRs. Saturday will be just the beginning of an inspirational GRC career.